Dario Argento’s horror film is a major cat movie, and showcases cats in a variety of different settings. In Rome, music student Mark Elliot (Leigh McCloskey) gets a letter from his sister Rose in New York telling him about The Three Mothers, evil sisters who rule the world. Mark reads the letter during a class while Verdi’s Va, pensiero chorus from Nabucco is playing. Something is making him uncomfortable; he looks up to find a young woman (Ana Pieroni) and her fluffy cat staring at him intently. The young woman is one of the evil sisters – The Mater Lacrimarum or The Mother of Tears. I’m not entirely sure how we know that; she might be just a non-evil music student hanging out in a cocktail gown – except the cat is a dead giveaway, effortlessly demonstrating all the attributes of a WHITE CAT OF EVIL except for the colour of its fur, which is kind of champagne-coloured. Elsewhere in the film, Elise (Daria Nicolodi) is attacked by cats (in other words, someone offscreen throws cats at her head) before being stabbed to death, though not by the cats. In an attempt to make them seem more vicious, there are big close-ups of their teeth and claws, though cat-lovers will probably just think awwww will you stop throwing those cute kitties at the girl? Later, a crippled antique dealer tries to drown a sackful of cats in Central Park in the middle of the night, but falls into the water and gets eaten by rats. Which serves him right, though imdb trivia assures me the sack did not contain cats but a mechanical device to simulate their movement. Hmm. 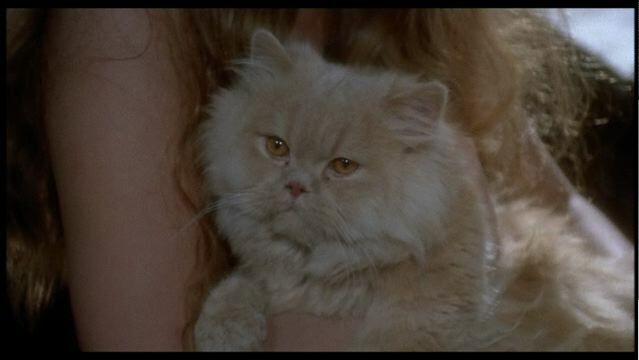 Nevertheless, this being an Italian horror movie, far from the bailiwick of the American Humane Association, I don’t suppose those cats were exactly cossetted on set, apart from maybe Champagne-Coloured Cat of Evil, which looks perfectly comfy in the arms of Mater Lacrimarum. Those bare arms, though. I bet it was de-clawed. This entry was posted in A Major Cat Movie, Catrifice, Catshock, Catzilla, Pussilla, White Cat of Evil and tagged Inferno. Bookmark the permalink. I talked to Argento around the time of the release of Two Evil Eyes (1990), and the cat in his half of the film, a loose adaptation of The Black Cat, starring Harvey Keitel, was definitely de-clawed, because we talked about it – I think that was the first time I’d ever heard about the practice, and I was quite shocked. But that was filmed in The US; according to imdb, the “cat wrangler” was someone called Chris Peworckik-Call. Two Evil Eyes is his only credit – probably just as well.